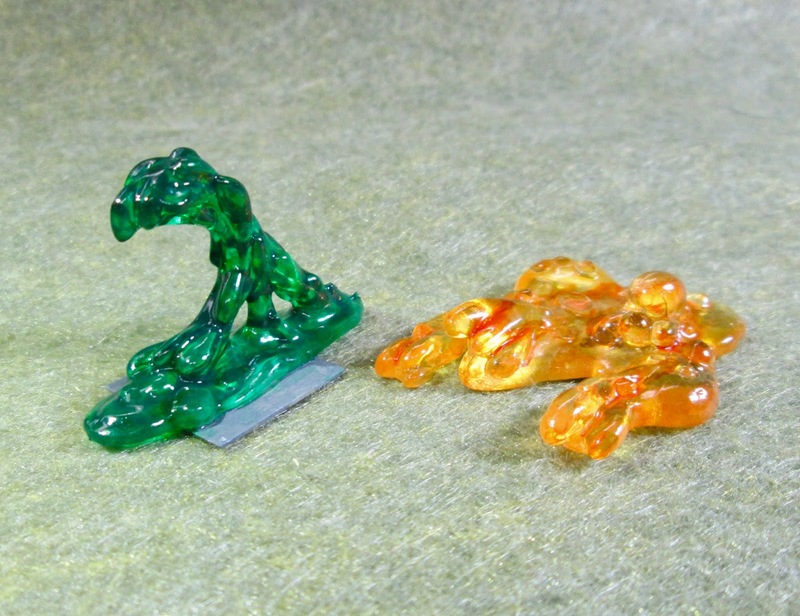 Translucent Slimes: Bones 2 Figure | H.A.W.K.S. I prepped the figures in the usual way; soaking them in a dish of water with a couple drops of dish-soap added and then rinsing and drying. 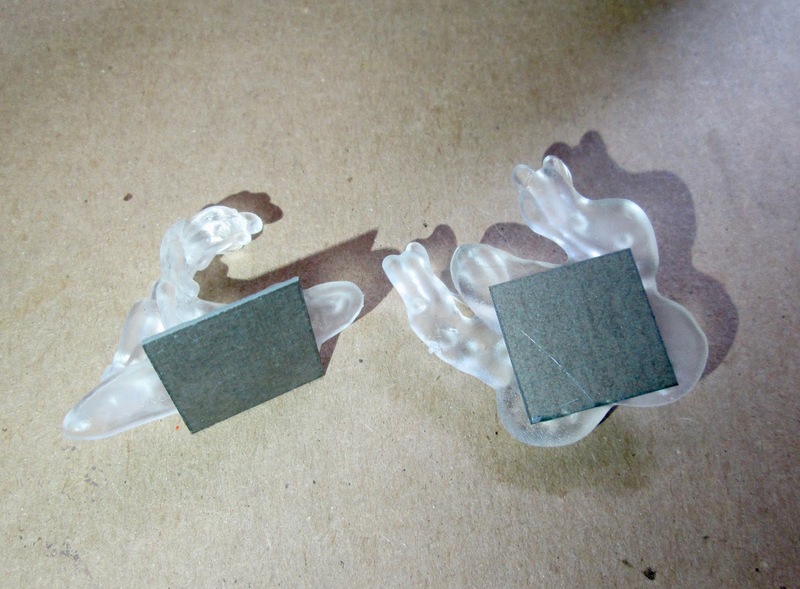 I then glued them to ½"x1/2" black-primed steel bases with Gorilla superglue gel. 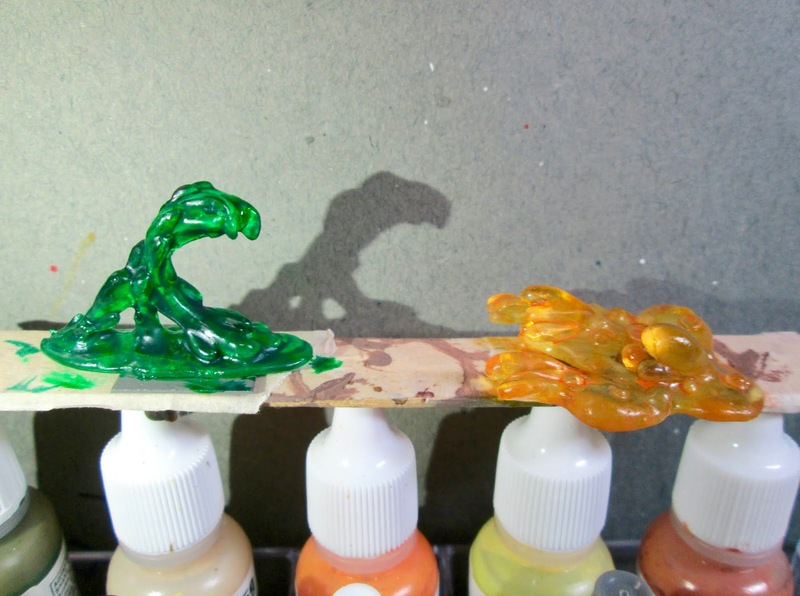 I then glued the figures to a tongue depressor with a couple drops of the Elmer’s glue each. I went back and forth about whether to even base these or not, as bases on translucents are difficult to handle because you can see them through the mini. In the end I decided on these small steel bases, with the hopes that their size and the irregular nature of the miniatures’ surface would make them had to see. 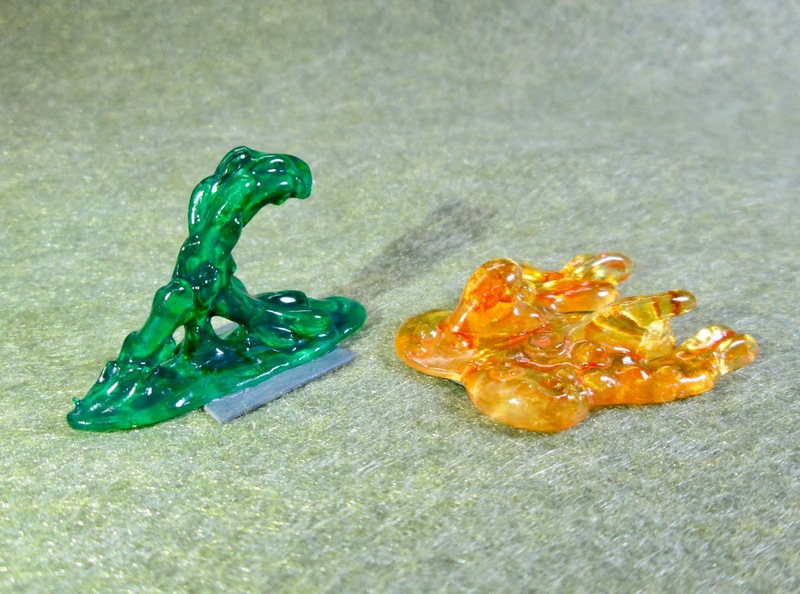 They fit completely under the large flat slime, and only stuck out a little from the more vertical slime. Their thinness would help the minis sit almost flat on the surface of the table too. 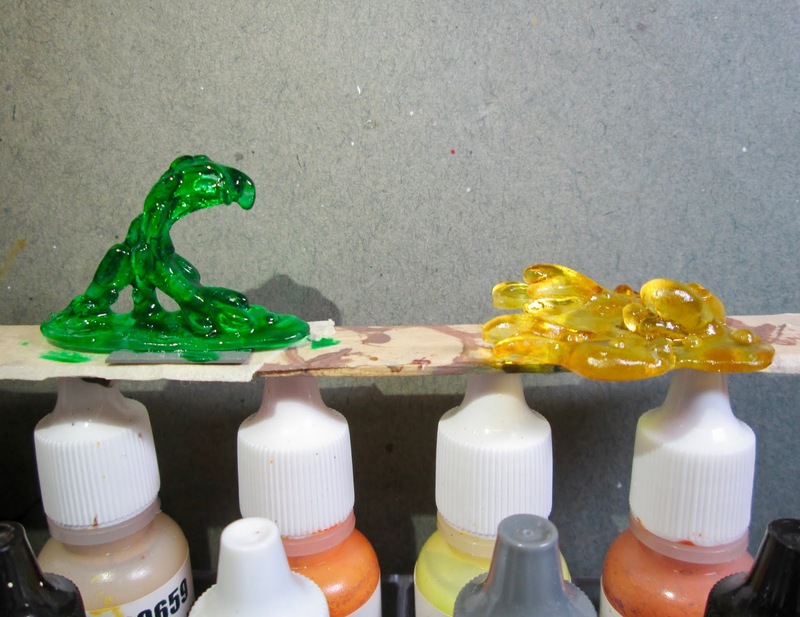 I decided I would go for a Green Slime look with the vertical one, and an Ochre Jelly look for the flat one. So, I began by painting the vertical one with Mr Color “Clear Green” (This is not an acrylic paint and comes with all sorts of scary warnings on the label, so I would not recommend it. I only have it as I picked up on clearance at a local hobby shop before I realized what it was. I hope to replace it soon with some Tamiya clear.) , and I painted the flat one with Tamiya Color “Clear Yellow”. Next, I gave the vertical one a wash with Iron Wind Metals “Dark Green” ink, and the flat one a wash with Iron Wind Metals “Orange” ink. When they were dry, I gave them a coat of Americana "DuraClear Gloss Varnish”. I realized I still wanted the base of the green one to be matte, so I subsequently sprayed the figure with Testor’s “Dullcote”. 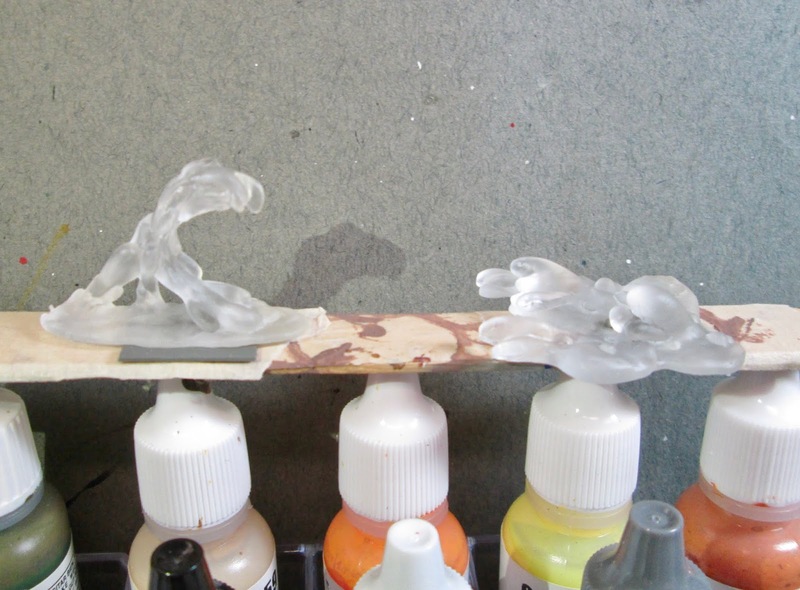 When that was dry, I went back over just the slime with the “DuraClear Gloss Varnish”, leaving the base flat. While simple, I’m really happy with how these turned out. And in those that didn’t hear the news, Reaper announced that they have begun Bones 4 Kickstarter fulfillment! If you didn’t see it, check out the Reaper CEO’s video message for an amazing look at one of their Kickstarter fulfillment warehouses!